Modular Platform Systems, also known as Multi-access Component Systems (MAPS) are prefabricated safety platforms that allow for a broad spectrum of applications. These systems are long-lasting and non-corrosive structures that are suitable for any of your industrial needs. 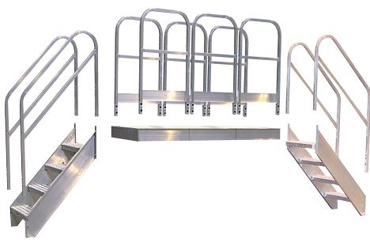 They are composed of six main components: Platform Units (MAPU), Stair Units (MASU), Platform End Supports (MAEU), Stair Railing (MASR), Platform Railing (MAPR), and Modular Fixed Ladders (MAFL). These platforms offer versatility that can be utilized at any job site, with their lightweight and portable construction they are simple to install and are adaptable for projects in the present as well as the future. 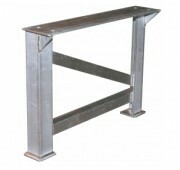 These units offer simple bolt-together technology and are fully OSHA compliant. 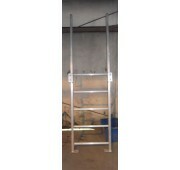 They provide the perfect solution for crossing over pipes, fixed machinery, walls or many other obstructions. 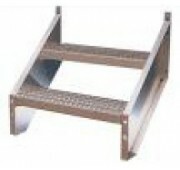 Come standard witrh aggressive tread decking for maximum slip-resistence in many conditions. Pre-drilled modular design allows for a wide range of configurations. 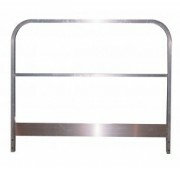 Lightweight construction allows the components to be carried by hand. Offer 50lbs per sq. ft. capacity.